For richer or for poorer. This is what most of us promise our spouse when we pledge ourselves in marriage. Unfortunately, many couples today can’t seem to survive either richer or poorer due to poor money management skills. It’s no secret that fighting about money puts a huge strain on a relationship, says Jennifer Ryan Woods, personal finance expert, writing for Forbes. “Money issues are so troublesome that people who say they’re experiencing stress in their relationship cite finances as the number one reason,” Woods explains. According to South African attorney Hugh Raichlin, conflict over finances is one of the top three reasons for divorce in this country, “where we live in tough economic times”. This may seem like a grim prognosis for married couples, but it doesn’t have to be. “There are various steps that experts say couples can take to avoid letting money matters get the best of their marriage,” Woods continues. “Of all the couples that I see, the number one mistake they make is spending too much on the wedding,” says legal expert Ann-Margaret Carrozza, who specialises in personal finance. “Most couples starting out can’t afford to pay cash so they’re going into debt to pay for this one-day celebration,” she says, adding that “for many young couples that is on top of student loans and credit card debt. So, they’re literally drowning in debt out of the gate.” While this doesn’t mean couples need to forgo wedding festivities, those with limited budgets should do something smaller or find other ways to make the wedding more affordable – and save the big party for the fifth or tenth anniversary, when they’re in a better financial position. For many couples, a joint bank account is the ultimate symbolic gesture of their financial union. However, Mail & Guardian explains that true joint bank accounts, where both partners have equal rights and responsibilities, are not available in South Africa. One partner can run an account and give the other signing powers, but the primary account holder has full responsibility and can revoke or extend the partner’s signing powers at will. Fully disclosing your financial situation with your significant other before tying the knot is a must, regardless of how uncomfortable it may be. “This is the time to mention outstanding debts, loans, income sources, investments or other financial assets or obligations,” Woods says. If you’re already married and still withholding this info, now is the time to bring it up. If you’re in a second or third marriage, and you are obliged to pay child support or, if you expect to provide financial support to ageing parents or adult children in the future, you need to address this as early as possible. Set goals and prioritise payments – together! Start by reviewing your joint expenses over the last few months to determine how much you’ve been spending and if you need to bring that amount down. Then, establish rand limits per category that you create, according to your after-tax income. Don’t forget to allocate for unexpected or irregular expenses, such as routine car maintenance or doctor’s appointments. After you have determined your baseline financial status, discuss your long-term financial goals in depth. For example, do you plan to retire at a certain age? 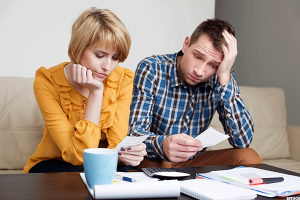 Do you need to settle debt urgently? Draw up a budget, and make sure you stay within your spending allotment, adjusting accordingly as your situation, expenses, or income changes. Stay on track by scheduling weekly money meetings. During meetings, discuss your budget for the month, whether you have any upcoming bills to pay, how you are doing with your joint financial goals, and anything else that is related to money. “These meetings are great because they strengthen the communication in your marriage, as well as your level of trust,” says Casey Slide, a specialist writer for MoneyCrashers.com. “Setting aside time to talk also helps a couple to stop worrying about money, because they know that money matters will be dealt with,” Slide adds.